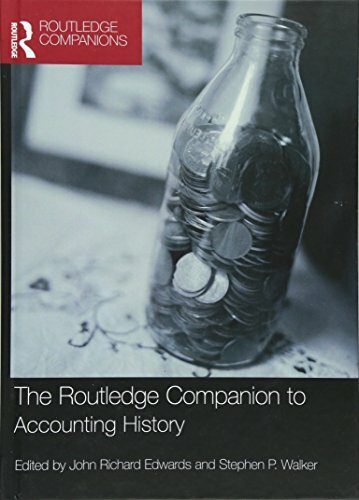 The Routledge Companion to Accounting History shows how the seemingly innocuous practice of accounting has pervaded human existence in fascinating ways at numerous times and places; from ancient civilisations to the modern day, and from the personal to the political. the role of accounting in the government, protection and financing of states including chapters on the important role played by accountancy in religious organizations, a review of how the discipline is portrayed in fine art and popular culture, and analysis of sharp practice and corporate scandals. The Routledge Companion to Accounting History has a breadth of coverage that is unmatched in this growing area of study. Bringing together leading writers in the field, this is an essential reference work for any student of accounting, business and management, and history. John Richard Edwards is a Professor of Accounting at Cardiff Business School, UK. He is a regular contributor to international refereed journals, and the author of A History of Financial Accounting (Routledge, 1989). Stephen P. Walker is a Professor of Accounting at Cardiff Business School, UK. He is a former editor of Accounting Historians Journal and President of the Academy of Accounting Historians. His publications concern accounting histories of professionalisation, gender, social control and identity. EDWARDS, JOHN RICHARD; WALKER, STEPHEN P.